It’s hard enough to make diet-friendly food choices. But I’ve recently developed an “eco conscience,” and am trying to choose Earth-friendly options, too. I’ll admit, there are days when I only have time to look at what’s handy, choose the healthiest option, and grab a fork. But more and more voices are asking Americans to think about how our food choices impact the environment. You’ve probably read plenty about sustainable farming versus industrial farming, food miles, and going local. But how do you make it work when real life gets in the way? Cattle-rearing generates more global warming greenhouse gases, as measured in CO2 equivalent, than transportation, according to a 2006 report from the United Nations. Try this: Think of meat as a garnish, instead of the bulk of your meal. If you can make a big salad, add a small amount of thinly sliced meat on top. Try this: Buy only what you need, take only what you’ll eat, and eat more leftovers instead of tossing them out. Got extra mushrooms? Search healthy recipes by ingredient. Food in a box, on a per-pound basis, has more calories, unhealthy ingredients, and environmental impact than natural foods. Try this: If you’re looking for a snack to control your munchies, look in the produce section. Get your sugar fix with fruits like strawberries* or try edamame for a filling mid-afternoon snack. Use our guide for choosing the best seasonal produce, try healthy recipes for fruits and veggies, or find a local farmers market. Want more tips? This year there are some great new cookbooks about eating and cooking in an earth-friendly way. Some, likeÂ Cooking Green by Kate Heyhoe and Big Green Cookbook by Jackie Newgent, RD, are good guides to changing how you shop and cookâ€”complete with recipes. Others, like Mark Bittman’s Food Matters, take it a step further by putting an emphasis on personal health. In fact, Bittman lost 35 pounds by eating more eco-consciously. 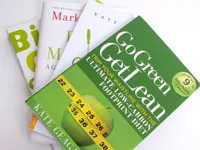 Similarly, Go Green Get Lean by Kate Geagan, MS, RD, is a six-week plan to help you lose weight and eat greener at the same time. If you’ve been making environmentally-friendly food and cooking choices while losing weight too, share your tips! Leave a comment. *UPDATE 4/23/09 The post originally listed pineapple as a low carbon food option. However, itâ€™s a high carbon fruit due to the fact that it is only grown in tropical locations and has to travel long distances. Are You Afraid to Go to the Doc Because You’re Fat?